When researching recipes for the Italian GP, I felt overwhelmed by the ridiculous variety of delicious food I could make. Choice paralysis took over just by the thought of whether I should do a pasta dish, or make pizza, or find something properly authentic I've never made. I have cookbooks, and blogs I follow, and the entirety of the internet full of recipes that could be amazing, and will be, because Italian food is frickin' amazing. How to choose?! To narrow it down I'm going regional. Monza is one of the classic F1 tracks, and it resides in the Lombardy region of Italy. Lombard cuisine is known particularly for a unique Risotto made with saffron (Risotto alla Milanese) and for deep braises like Osso Buco. I was also tempted to make something from the 'TIMES Foods of the World – Cooking of Italy' book from the 1960’s. It actually did have some gems like Polpette alla Casalinga (Meatballs - fried to perfection), Pere Ripiene (Pears stuffed with Gorgonzola cheese), and Pollo alla Cacciatora (Braised Chicken with black olive and anchovy sauce). But we stuck to the reliability of the internet for this meal. However, we did pull a few cocktails from the Spritz cocktail book for your drinking pleasure! Check out the Americano, Negroni Sbagliato and the Spritzz on my Spritz post. For dessert I found Giada's Nonna's Lemon Ricotta Biscuits and Olive Oil Gelato (and yes, me and Giada are totally on a first name basis). They turned out to be particularly good together! Look for recipes in follow up posts. 1. For the Shanks: Pat shanks dry using a paper towel. Place 1 cup flour on a plate. Season beef with salt and pepper and dredge in flour, shaking off excess. Heat oil in a large Dutch oven over medium-high heat until lightly smoking. Add meat and cook without moving until well browned on first side, about 5 minutes. Flip and cook until browned on second side, about 4 minutes longer. Transfer to a slow cooker. 2. Add onion, carrots, and celery to the Dutch oven, reduce heat to medium, and cook, stirring occasionally, until vegetables begin have softened, about 7 minutes. Add tomato paste and garlic. Stir and continue cooking until fragrant, about 1 minute longer. Add wine and scrape up any browned bits from the bottom of the pot using a wooden spoon. 3. Transfer the contents to a slow cooker and add stock, vinegar, oregano, thyme, bay leaves, and ground clove. Season with salt and pepper and cook on low until meat is tender, about 6 hours. 4. Remove and discard thyme sprigs and bay leaves. Skim fat from the sauce and transfer 1/2 cup of gravy to a medium saucepan. Whisk the remaining 2 tablespoons of flour into the reserved gravy until no lumps remain. Add the rest of the sauce to the saucepan. Whisking frequently, bring the sauce to a rolling boil over high heat and cook until the sauce achieves a gravy-like consistency, about 4 minutes. Season to taste with salt and pepper. 5. For the Gremolata: Meanwhile, combine parsley, lemon zest, and garlic in a small bowl. 6. Arrange shanks on a platter and spoon sauce on top. Garnish with gremolata and serve. 1. Combine rice and stock in a large bowl. Agitate rice with fingers or a whisk to release starch. Strain through a fine-mesh strainer set over a 2-quart liquid cup measure or large bowl. Allow to drain well, shaking rice of excess liquid. 2. Heat oil in a heavy 12-inch sauté pan over medium-high heat until shimmering. Add rice and cook, stirring and tossing frequently, until all liquid has evaporated and rice sizzles and takes on a nutty aroma, about 5 minutes. Add onion and continue to cook, stirring frequently, until aromatic, about 1 minute. Add wine and cook, stirring occasionally, until the pan is nearly dry, about 3 minutes. 3. Give reserved stock a good stir and pour all but 1 cup over rice. Add saffron and a large pinch of salt, increase heat to high, and bring to a simmer. Stir rice once, making sure no stray grains are clinging to side of pan above the liquid. Cover and reduce heat to lowest possible setting. 4. Cook rice for 10 minutes undisturbed. Stir once, shake pan gently to redistribute rice, cover, and continue cooking until liquid is mostly absorbed and rice is tender with just a faint bite, about 5 minutes longer. 5. Remove lid. Stir remaining 1 cup of stock to distribute starch, then stir into rice. Increase heat to high, add butter, and cook, stirring and shaking rice constantly until butter has melted and rice is thick and creamy; add more stock or water as necessary if risotto becomes too dry. Off heat, add cheese and stir rapidly to thoroughly incorporate. Fold in heavy cream, if using. Season with salt. Serve immediately on hot plates, passing more cheese at the table. 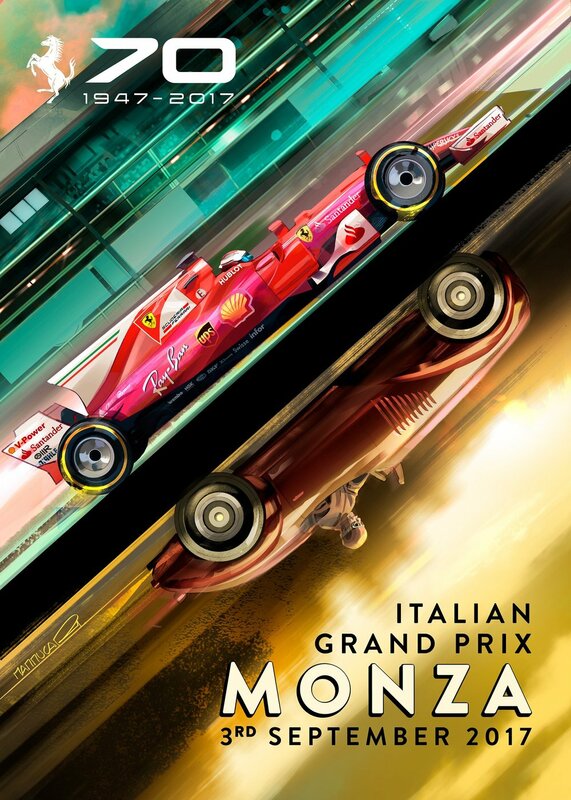 Ferrari's home race poster. So gorgeous. And in case you aren't convinced: this morning it is recommending: 'For Shame: 80's and 90's Guilty Pleasures', don't mind if I do.